It has been a life-long dream of Justin’s to go to the annual motorcycle rally in Sturgis, SD. Since this is a once-in-a-lifetime trip, we were determined to make Justin’s dream a reality! 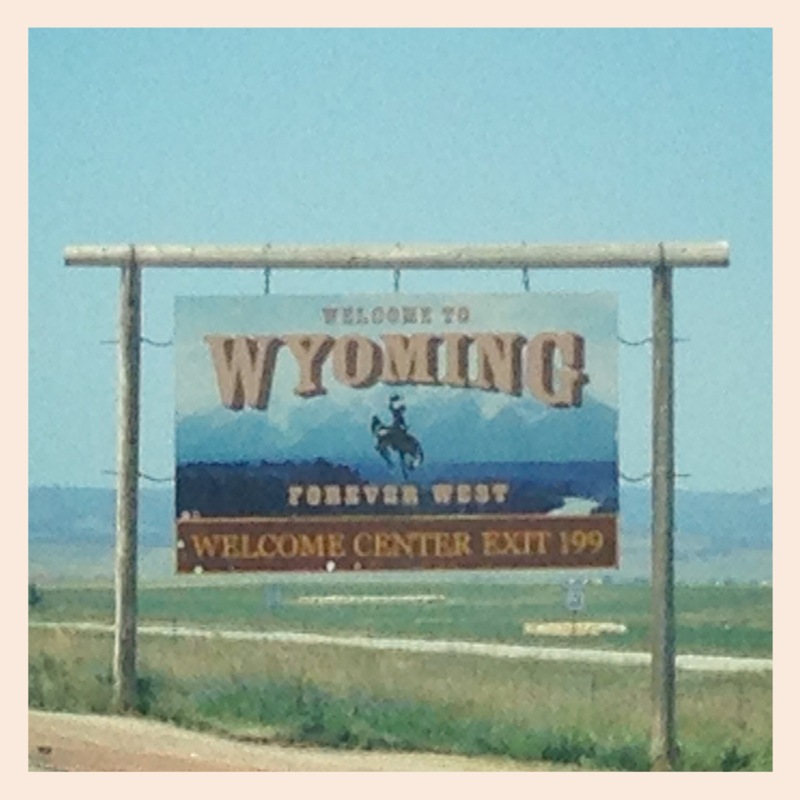 We left Wyoming today and headed to South Dakota to catch the tail-end of the week-long rally. Western Wyoming is much prettier than the barren flatlands of central Wyoming. Staying at a campground in Spearfish, SD, we were only about 15 miles west of Sturgis. There were countless bikers camping out and a constant rumble of motorcycles as they went by. If there were that many motorcycles outside of Sturgis, we knew the rally was going to be amazing. We couldn’t wait! After getting set up at our campsite, we visited downtown Spearfish where there was a little street fair and live music. 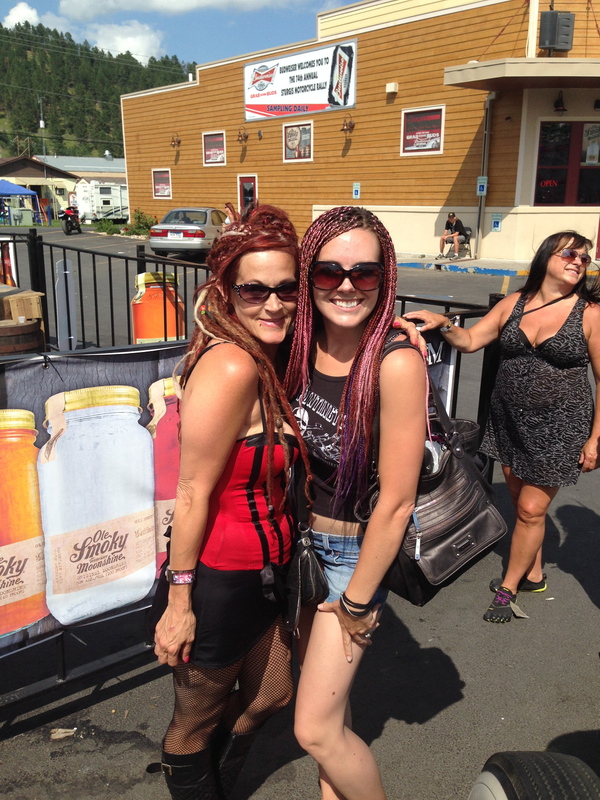 Today is the day for us to see the 74th annual Sturgis motorcycle rally! Justin finally gets to cross Sturgis off his bucket list! The motorcycle rally did not disappoint. As we rolled into town, we were blinded by the chrome and deafened by the roar of thousands upon thousands of motorcycles. There were rows of killer bikes lining the streets. It was actually a little bittersweet to be at Sturgis without our Harley, especially since the surrounding area would be amazing to ride a motorcycle through. 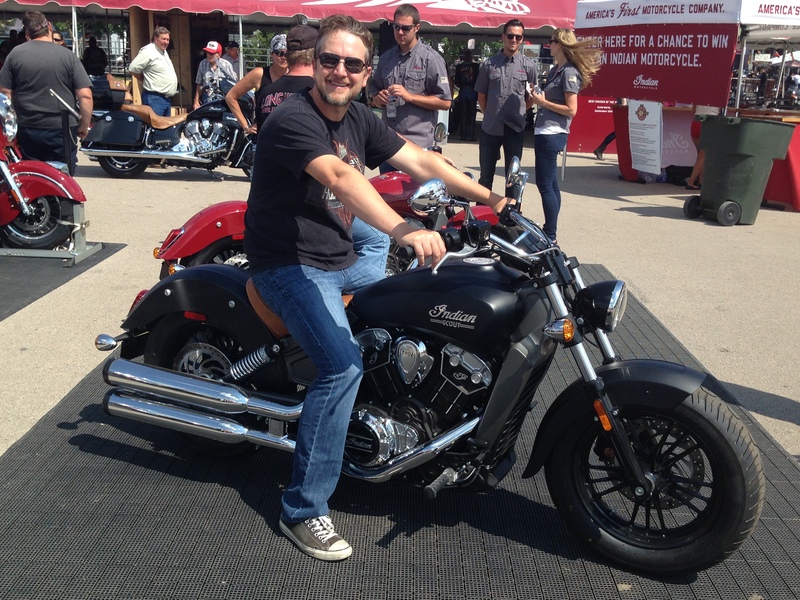 However, Justin found the next bike he wants: an Indian Scout, Indian’s first sport bike since the 1940’s. Anything you could possibly want for a motorcycle could be found at the rally. We saw a plethora of amazing custom choppers along with grisly bikers and scantily clad women. It was definitely entertaining! There was also a motorcycle stunt show called “The Wall of Death” that was awesome to see! The best way to describe it is a giant wine barrel cut in half with motorcycles defying gravity by riding horizontally along the walls of the barrel. After walking through the streets of bikes and vendors, buying some t-shirts, getting some food and trying moonshine, we had our fill of the rowdy rally and called it a day. We had a blast! Can’t wait to go back with a motorcycle! Time for some national memorials! We headed roughly 60 miles south from our campground to Mount Rushmore. 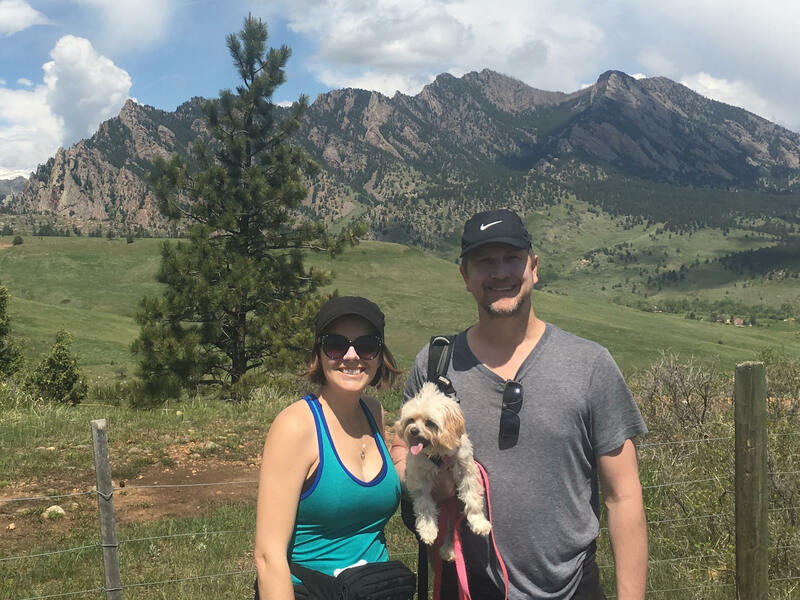 We enjoyed the drive through the Black Hills National Forest, the small towns with big character and the scenic hillsides. When we reached the monument, I’ll be honest, it wasn’t as big as I thought it would be. However, it was still impressive and wonderful to see it in person to fully appreciate the scale. As an artist, Rushmore has always been on my bucket list of things to see in my life. It was surreal to finally be there. The memorial also allowed us to learn a little more history behind Mount Rushmore, such as who sculpted it and the challenges they faced with carving 4 presidential heads into a mountain. It took 14 years and several hundred workers to create the massive sculpture. We took a short trail from the main viewpoint, which gave us a more close-up look of the faces from different angles. The detail is striking! I especially liked the rim of Theodore Roosevelt’s eyeglasses perched on the bridge of his nose. From Mount Rushmore, we made our way over to the Crazy Horse Memorial, another sculpture carved out of the Black Hills. When we were back in Wyoming, a couple who had just come from South Dakota recommended that we continue our tour from Mount Rushmore to Crazy Horse. As we approached the memorial, we had a good view of the work in progress and were surprised to see how much was still left to finish. 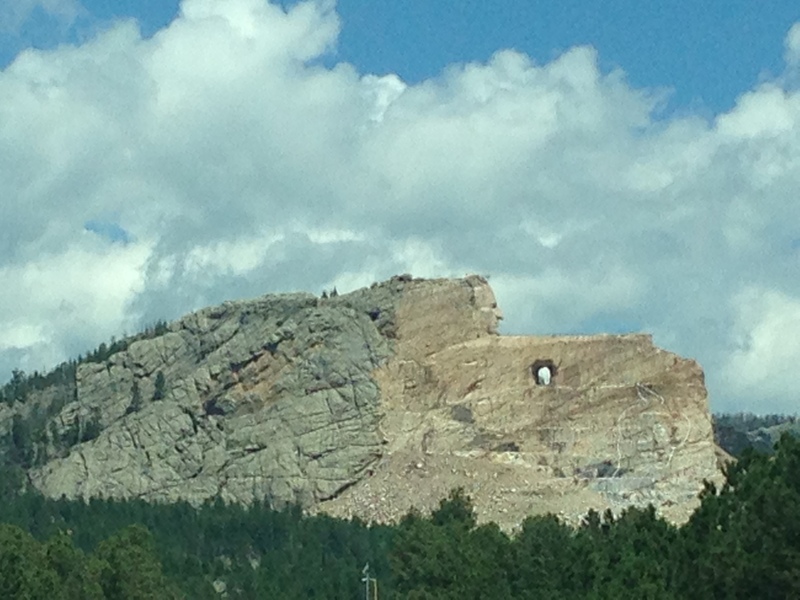 It appears as though the only area close to being completed is the head of Crazy Horse, but they still have to carve out his body and the horse he’s riding. They’ve been working on it since 1948! 66 years, and it’s not even close to being finished. It may not be complete within our lifetimes, which is disappointing. It’s going to be massive at 563′ tall and 600′ wide when it’s finally done. To give you an idea of how large that is, the head for Crazy Horse is 80′ high versus the heads of the Presidents of Mount Rushmore, which are only 64′ high. Even though the Crazy Horse Memorial is unfinished, it was still neat to see it and picture the completed version in the raw mountain. While in Wyoming and South Dakota, people kept telling us about Devil’s Tower. 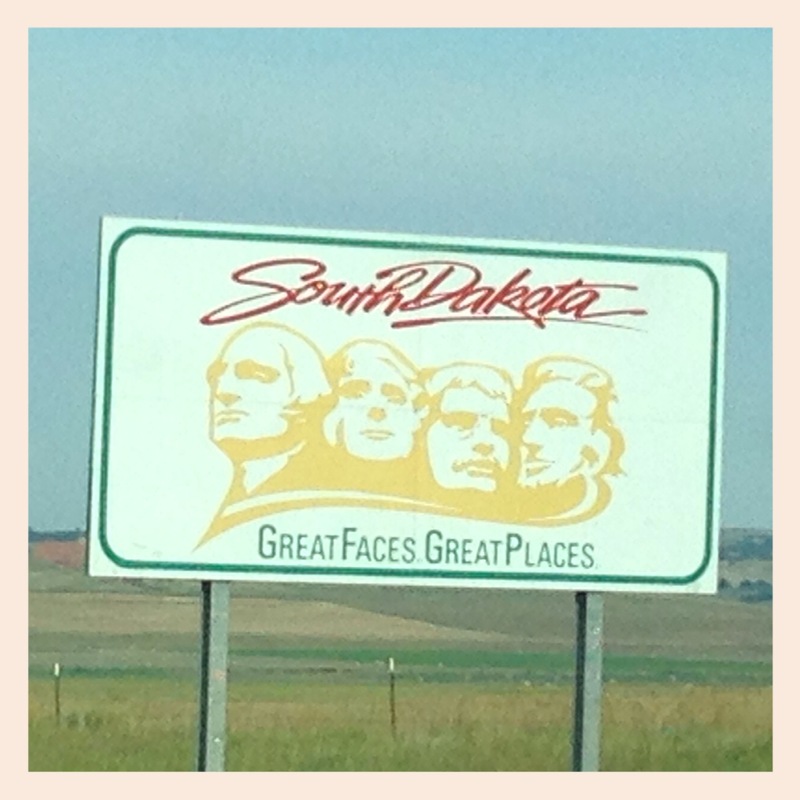 So for our last day in South Dakota, we decided to see it. We traveled about 60 miles back into Wyoming to the Devil’s Tower National Monument, America’s first national monument! As we got closer, we could see the tower in the distance and were in awe of it’s fascinating ridged structure. It’s out in the middle of nowhere all by it’s lonesome with nothing nearby even vaguely resembling it. So random! There are several different legends regarding the tower, but my favorite goes something like this: Some Native American children were being chased by bears and jumped onto a low rock. They prayed to the rock to save them. The rock heard their prayer and began to push itself up out of the ground, raising the children out of reach from the bears. As the bears lunged for the children, they scratched the rock and fell back to the ground. The ridges seen on the tower are the claw-marks from the bears. Now, the actual science behind it! I was never good at science though, so just a heads-up: this explanation will be extremely basic. Here goes… Apparently, magma built up below the earth’s surface and intruded the existing layers of sedimentary rock. The magma eventually cooled underground and became as hard as granite. As the surrounding earth eroded, it remained in the form of a ridged, rock tower. Make sense? For a more detailed, scientific description read about the geologic formation HERE.